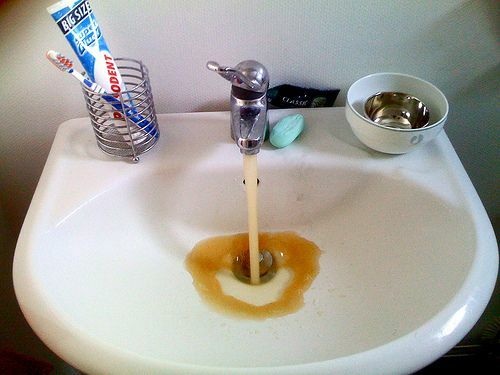 In some areas, there might be contaminants in the water that result in a change in the way the water tastes and smells. Of course, in such cases, you will find it very difficult to use the water for drinking and even for cooking. The filters that are most ideal for getting rid of such contaminants are the ones that have granular activated charcoal. This is a substance that absorbs all the particles that are responsible for a change in the taste and smell of the water, giving it a more natural taste and smell. Many of the rocks in the earth’s crust contain a large amount of iron. When this is exposed to enough water and oxygen, it tends to rust and then mix with the water coursing through the rock. If your well water has too much rust, this will manifest as a red deposit on surfaces such as in bath tubs and toilets. These types of stains are usually difficult to remove, and also unsightly. A high quality filter will be able to remove such particles. Using a water softener also helps in this as well. There are many sources of microbes in water that is gotten from a well. They could be from the surrounding rock, from effluent that seeps from surrounding waste disposal units and from surface water that transports the bacteria into the well water. There are some filters that can get rid of some types of bacteria, parasite and their eggs. However, just to be sure, you should make sure that all well water is boiled before use as well. This is one of the most important toxins in the world. It is responsible for various effects including a degradation of central nervous system function as well as cardiac problems. One of the major problems with lead toxicity is that when the lead salts are dissolved in water, it’s usually impossible to know that they are there by tasting or looking at the water. To remove it, you could use a dedicated lead filter, or use a well water filter that has lead-removing properties. In summary, there are many things that are likely to contaminate water that you get from a well. Using a high quality certified well water filter is one of the most effective ways of getting rid of them.